That was what the kids exclaimed when I told them to wear a pair of mis-matched socks to the show Wonderland by Andsoforth. 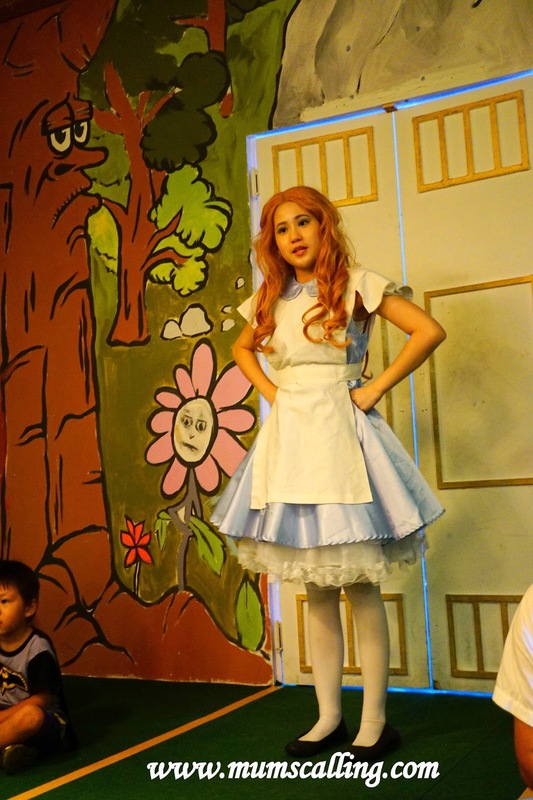 Wonderland is a children’s play based off Lewis Carroll’s Alice Adventures in Wonderland. 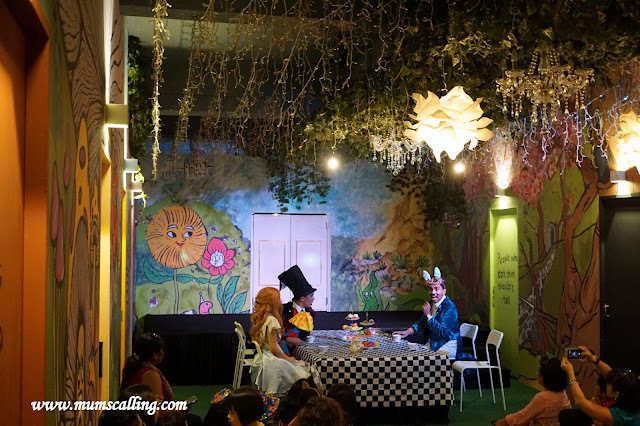 A play that is different from the usual stage and chair seats setting, but one that invites free floor space for little audience to sit and interact with the casts. Upon arriving, we were kept on suspense to wait outside for some moments before the door opened. We loved that the welcome was really secretive and surprised. 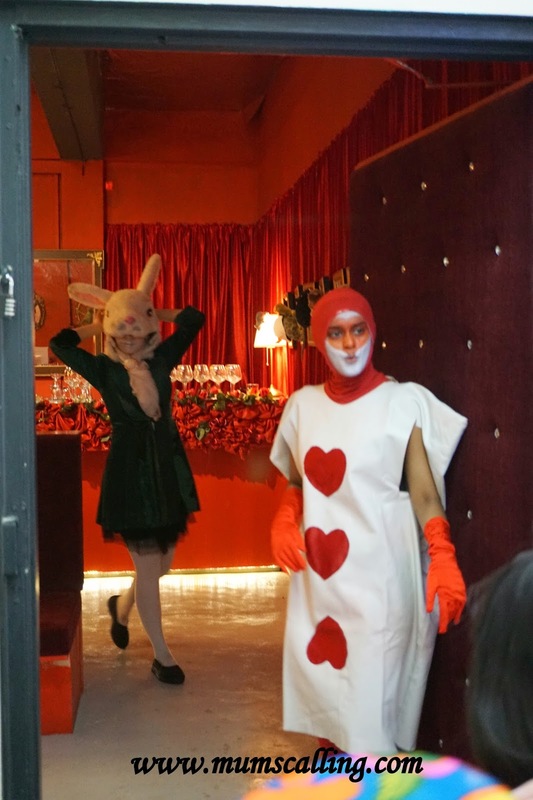 We didn’t know we would be warmly welcomed by the casts when the door opened! And there, they do check on those mis-matched socks! Making sure you wore a pair. No idea why mis-matched socks, but I wasn’t on a pair. And oops, I became their target for entertainment. 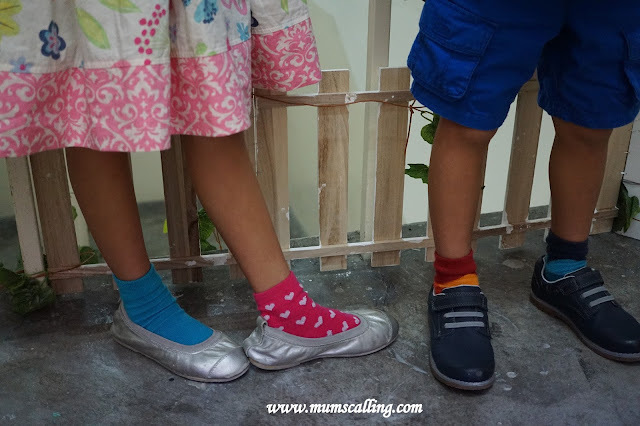 So yeap, parents should slip in those mis-matched socks too. There's no way to escape forgetting those socks because a friendly reminder comes through your phone on the day of the show. And from here, the adults entered through the little door, while the children through the big door to where the show will be. The stage set was beautifully drawn with arts on its walls, all round the room. It felt like we entered an enchanted world. Wonderland not one play with much singing and dancing like the usual, but one that's extremely close up and interactive. It is one with a small and cosy audience size. For being early, we had some fun and photo taking moments with the casts. Pre-show begins 30 minutes before the actual show begins. Do arrive early! 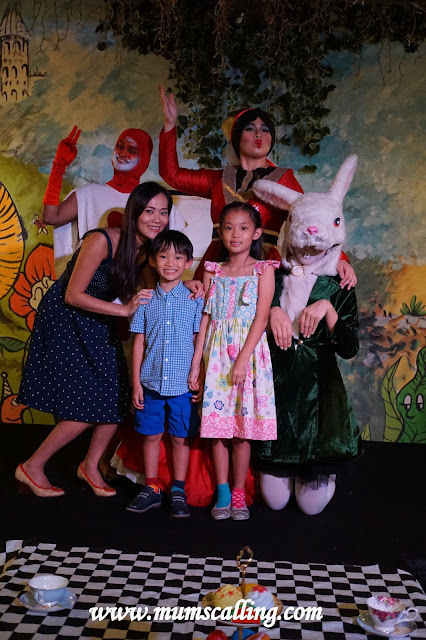 During the show, kids were welcomed to dance, sing and play games with the casts like Alice, the Chesire Cat, the Mad Hatter, the white rabbit and many more! We love the costumes and makeup of these casts! With the teaching element of promoting the importance of friendship, there were other learning points like telling the difference between a rabbit and a hare, as well as using rhyming words in a poem. In between, there were nuggets of humour exchanged between the casts which really cracked the kids up. 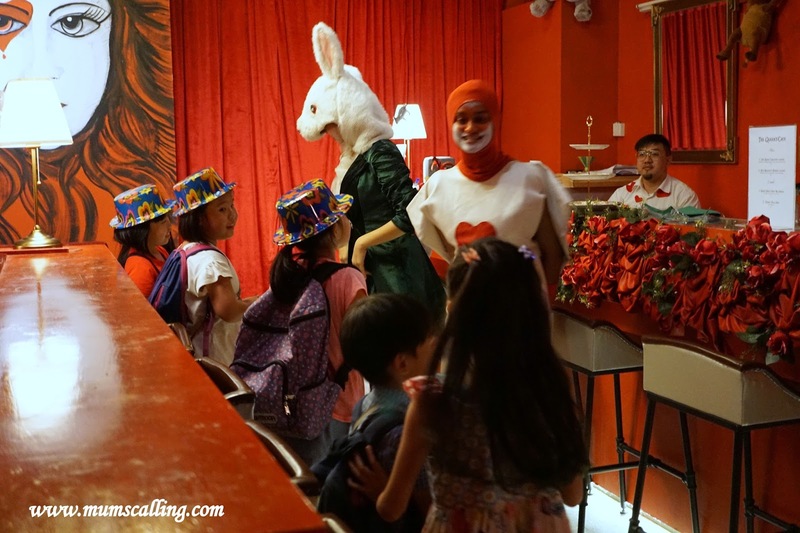 This 45 minutes show will be fun for little kids above 2 years old and even more fun if they love being spontaneous to the call of playing games, singing and dancing. Js were relatively shy beings, so they were less spontaneous in rising to the call of actions. Nonetheless, they enjoyed themselves. Though I will say this is a play that may be more suitable for preschoolers. And yes, there will be photo taking session with the casts after the show. Hang around! This is a different kind of show with a different kind of experience your little ones. 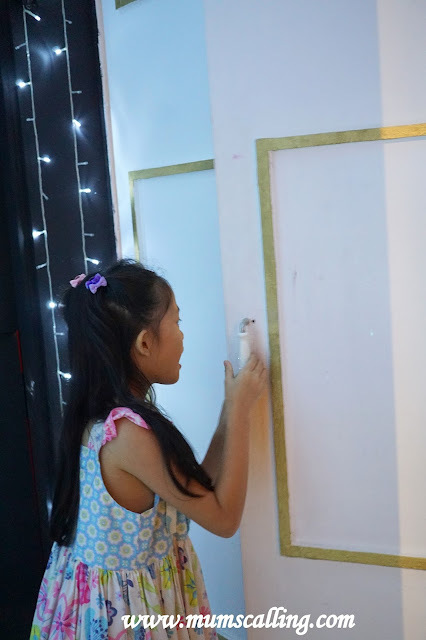 Our little ones felt pleasantly surprised! Disclaimer: Tickets were given for the purpose of this review. All photos and opinions are solely ours.